Although the exact beginnings of corned beef have been lost to history, it most likely came about when people began preserving meat through salt-curing. Evidence of its legacy is apparent in numerous cultures, including Ancient Europe, and the Middle East. The word corn derives from Old English, which is used to describe any small hard particles or grains. In the case of "corned beef", the word refers to the coarse granular salts used to cure the beef. Although it ceased to be an important commodity in the 19th century Atlantic trade due in part to the abolition of slavery, corned beef production and its canned form remained important as a food source during World War II. Much of the canned corned beef came from Fray Bentos in Uruguay, with over 16 million cans exported in 1943. Even now, significant amounts of the global canned corned beef supply comes from South America. Try this recipe if you are short on time. In skillet, melt butter over medium heat. Add potatoes, onions, salt, pepper and garlic, stir and evenly spread over skillet and press firmly, until brown about 10 minutes. Add corned beef, stir to combine, spread evenly over skillet and firmly press using spatula. Cook another 10 minutes. Stir in thyme and oregano. Enjoy! I remember my mom making this when I was growing. It's not a pretty dish but it taste so good. Thanks for taking me down memory lane. 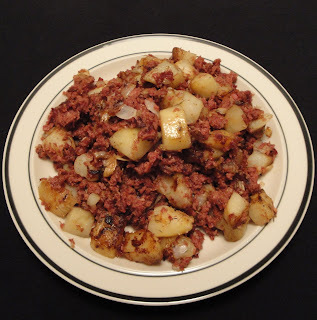 Wow, I haven't had corned beef hash in years but it brings back fond memories. Corned Beef Hash with a set of eggs sunny side up just makes my mouth water. Thank you for sharing!